The Village Hall was acquired in 1948 with the help of Miss Nora Watson, a major benefactor to the village, who was also instrumental in raising funds for equipment. The Village Hall and Playing Field are held in Trust and run by a committee of members from various groups, organisations and residents within the village. The Hall has had many changes and improvements over the years and was reopened in March 2007 by Mrs Shirley Brasher (Miss Nora Watson's niece) after major refurbishments and extension. It is well used for larger functions, meetings and activities by groups and organisations within and outside the village. The facilities include a large function room with tables and chairs, ladies and gents toilets, toilet for disabled, a new fitted kitchen, two new changing rooms with showers and a smaller meeting room. The Hall capacity is 120 with tables and chairs or 220 without. 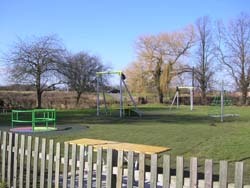 The Playing Field dating from before 1944, is approximately 7 and half acres which includes a football pitch and has a cycle track (leased and run by the Parish Council) in the far corner. There is also a small play park for 4 to 12 year olds and a hard tennis court. The tennis court was completely refurbished into a multi purpose activity area in the summer of 2008 and reopened in September during the Diamond Jubilee Celebration. In June 2010 as a result the village Parish Plan a newly constructed Multi Use Games Area next to the tennis court was opened by John Mann MP during a Village Hall Fun Sports Day. The children’s play area was much improved in 2012/2013. New equipment includes a cone climber, kiddies swings, a roundabout with wheelchair access, a zip wire and two picnic tables. 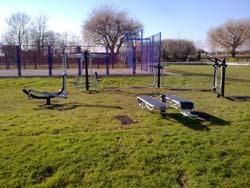 The adults, young and old, have not been forgotten with five outdoor gym exercise items erected next to the Multi Use Games Area. All these valuable amenities are there for everyone to enjoy it is hoped, for many years to come. For details of hire rates for village hall and playing field, for availability and to book please contact the Booking Secretary on 848756.